In a changing economy, strategies for developing job training requirements should focus more on where will be in the future than where are in the present. The lead time for job training development and adoption can easily be a couple of years. If the economy changes in such a way to render obsolete the current jobs for which training programs were developed, then the job training development effort could end up being a significant loss of time, money, and opportunity. For this reason, it is much better to focus on the job training requirements of the future. In this way, you increase the likelihood that high demand job training programs will be ready at the most opportune moment. The Bureau of Labor Statistics provides industry employment numbers from the most recent June 2018 jobs report as well as projected industry employment numbers for 2026. An analysis of this data can provide some useful information regarding opportunities for training development. 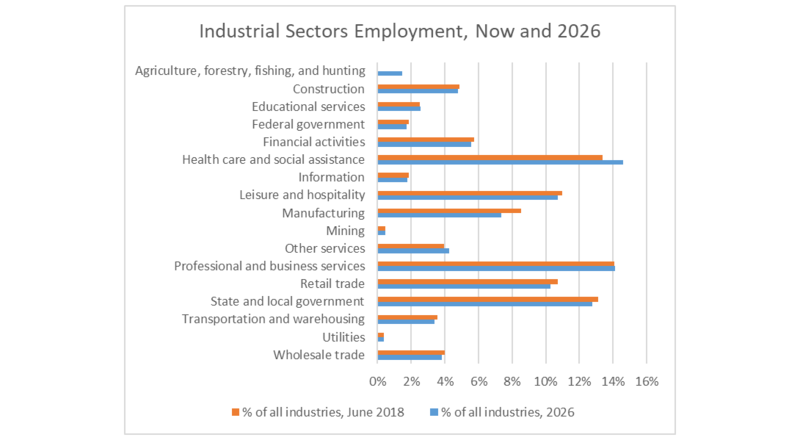 The following chart shows the overall percentage of employment of the main industrial sectors from the last month of available data (June 2018) relative to projected industrial sector employment for the year 2016. Two of the main industrial sectors worth taking a closer look at are the Health Care and Social Assistance sector and the Manufacturing sector. OJT.com provides a detailed breakdown of the Health Care and Social Assistance sector into its component subsectors along with the occupations projected to be the largest and have the most growth in each of those subsectors and the overall sector. Overall, occupations in this sector will continue to grow because the population needing these kinds of services will continue to grow. Technologies in this sector will continue to evolve, but these changes are viewed mostly as an evolution and not a disruptive sea technology change. The technical skills to address the evolving technologies in this sector can be handled, with training, by employees in their current occupations. An expansion of current training programs, with modifications to meet evolving skills, should suffice to meet this demand. OJT.com also provides a detailed breakdown of the Manufacturing sector into its component subsectors along with the occupations projected to be the largest and have the most growth in each of these subsectors and the overall sector. While the overall sector has been growing in recent quarters, relative to the other sectors, the Manufacturing sector is projected to occupy a smaller percentage of overall employment by 2026. The Manufacturing sector is going through a disruptive sea change as the adoption of automated production techniques and advanced manufacturing techniques take over significant portions of the industry. Though the overall number employed in this sector will decrease in the near future, because machines will be doing more of the work, the occupations that are available exhibit some of the greatest opportunity for training development. The nature of the future occupations associated with automated production and advanced manufacturing techniques is much more technological than the predominantly manual nature of older manufacturing occupations that the sector is moving away from. These new manufacturing occupations exhibit the greatest percentage of the skills gap and represent some of the greatest challenges for the training industry. This entry was posted in Careers and tagged future training, Job Skills Gap, manufacturing training, skills gap.